Having the correct hot water service installed can cut your electricity use down significantly. When we bought the house it had an electric hot water service as do most houses in Tasmania. Natural gas supply is very limited at the moment and bottled gas is the next best but very expensive. Originally we started looking at solar hot water systems. There are two different kinds available; flat panel and evacuated tube. Both of these need some sort of back up heating in Tasmania’s cooler climate, being quite far south in the Southern Hemisphere. Mandy likes to cook with gas so our initial research was into solar hot water with instantaneous LP gas booster. That way we would have LP gas to cook with also. 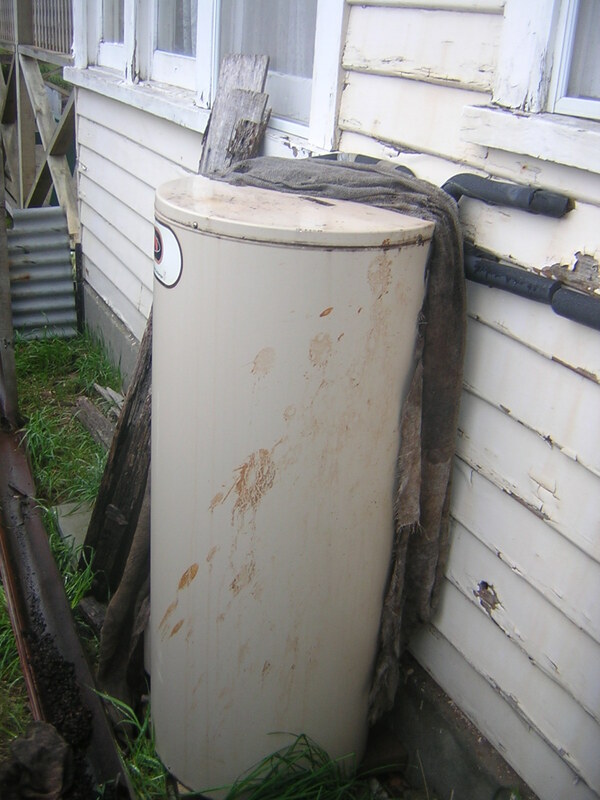 As we did more research we discovered another type of Hot Water System called a heat pump. Now in Tasmania just to confuse the issue reverse cycle air conditioners are called heat pumps as well. These are two seperate beasties but related. Heat pumps for hot water take heat out of the surrounding air even down to -10C and transfer it to water thus heating it up. They do this by the use of a compressor just like a fridge or air conditioner. Still electric they use approx 80% less power than a conventional electric hot water system and attract the Federal government rebates if replacing an exisiting electric hot water system. Our direction of thinking started to veer from solar to heat pump technology. 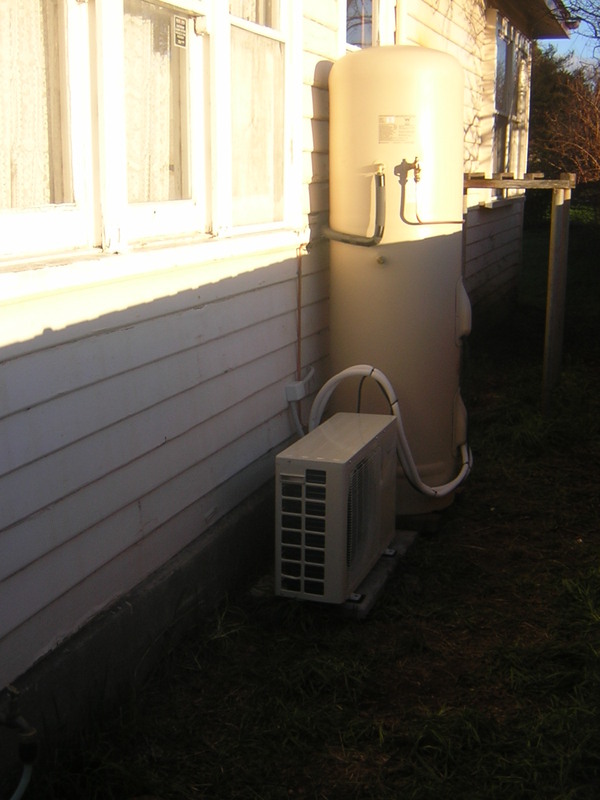 There are several advantages to heat pumps in Tasmania when viewed against Solar hot water. Most of the research was done on the internet and took many hours of looking and reading, finding a manufacturer and then chasing up leads to see if they were available in Tasmania and then in Launceston, our closest large centre (pop 67,000) but the aim of this site is to bring it all together. Our research led us to decide upon a heat pump hot water system. The next step was to find out which ones were available in Launceston. A great source of ideas and trades and products is the Building Selection Centre at 262 York St, Launceston. A browse through their many displays gave us brochures on heat pumps, double glazing, roofing, solar hws and much more. As the house progresses I am sure that we will return again and again. Simultaneous research on the internet and the home ideas centre narrowed the choices down to three products; two heat pumps, Quantum and Siddons; and one evacuated tube solar system by Hills. The solar system by Hills were distributed by Apollo Energy, 110 Elizabeth St, Launceston (Hills have now gone out of business) and the two heat pumps by Jessups Retravision, 106-108 Charles Street, Launceston. We decided on a Siddons heat pump and ordered it from Jessups Retravision on 12th July 2008. We paid $4290 less RECS of $1320 plus installation of approx $800. We then got our $1000 back from Federal government approx six weeks later. Total cost to us $2770. It was fitted on 22/07/2008. So far it has been great, there’s always plenty of hot water even on the coldest mornings. ← Floor plans: Now and for the future. Some good advices for hot water services. It was a nice learning experience going through your post. Thanks for the advice. Super web site.. Hope to definitely visit soon.. Thanks so much for your research you have saved me so much time! I am in Devonport and our hot water system has just sprung a leak. I had always been going to go solar, but had heard people were paying more to boost it because their tarrif for boosting was not the cheaper water tarrif rate. The other option I am considering is gas, as we do have gas available in Devoport. I am not sure about the running cost, but the other consideration for me has also been the environmental cost. As far as I understand Tasmania is now on the national grid so if we do get power from the big island we could well be using coal fired, although my understanding is we are supplying Victoria. Very hard to make a decision that is the best for the pocket and the best environmentally. So that brings me back to the heat pump option, do you think it uses less electricity as compared to a solar with a booster? Would you have gone with gas if it was in your area? I still have to investigate that option. Anyway good luck with your renovations and thanks so much for posting your research!